In previous postings I’ve speculated on the role of nature in our lifestyle. There have been debates on climate change; if we humans are the cause of the global warming; contributing to the increase polar ice melt, etc. 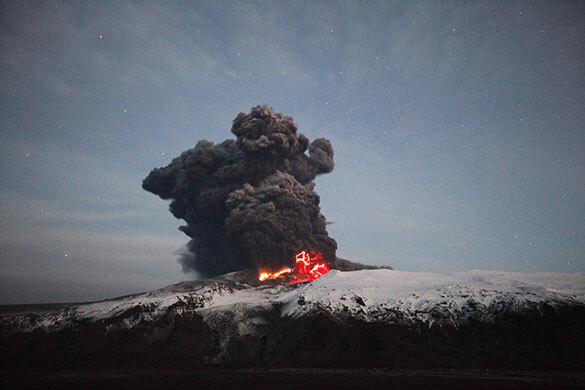 Now in the midst of the increased climate change an Icelandic volcano erupts and shuts down air travel to and from Europe for two weeks. Did nature intervene to reduce human impact on the atmosphere or is it just a result of our own inaction? After all, with melting glaciers, and warming waters is it possible that the volcano is just another response to our lifestyle? Is Gaia taking steps to mitigate the damage of our human intervention? My wife and I were in Cozumel when word arrived of the volcano eruption in Iceland. It had very little impact on our travel plans, yet our friends were flying back to Europe and for them the trip home was to become another adventure. Another friend happened to be in Africa and while he was flying from there to the Middle East, all flights are routed through Europe which meant he couldn’t go on to his next destination. Even flights from Asia were also stopped. Our civilization has evolved to allow global travel but at times like these we realize how fragile global travel can be. Man has been to the moon. Theoretical, we can travel from any point on earth to any other point on earth in an hour, all we need is a rocket and the proper trajectory. While man can fly, it is the earth that controls the atmosphere. We feel superior to nature as we strive to control and manage it. Every so often we are reminded that Gaia is in control.